The operating system won’t be released for another two years (at least), but Microsoft is already hard at work on making Windows 8 a significantly better user experience than even Windows 7 has been. At least, that’s according to a top-secret slide-show from Microsoft to vendors that’s emerged on an Italian Windows fan website. There are some serious changes in the works, if these slides prove to be true. Here’s what we know so far: it’s going to boot up faster, thanks to unspecified changes. There’s going to be a tablet/slate version, a laptop edition, and an all-in-one desktop-type edition. There’s going to be a greater emphasis on getting things to “just work” as well as renewed focus on cloud-based computing that will allow a user to get to their information from anywhere in the world just via a simple login. 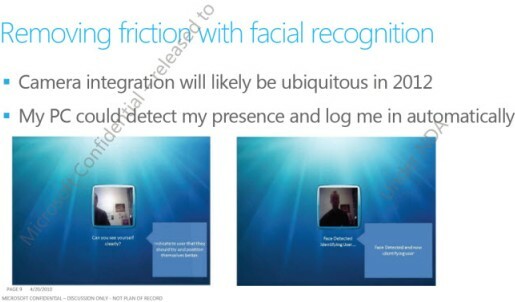 There’s also going to be increased visual recognition capability, for face-recognition logins to your computer at home. There’s also going to be an Apple-style app store called WindowsStore.com! So, long story short, your desktop is going to be more easily accessed, you’ll have less to remember password-wise, it’s going to be faster and show greater stability, and there’s also going to be apps. Sounds like it’s pretty much everything from the past two years (and all the competition) all crammed into a single OS. It’s a brave new world out there, gang.